Julian Slade and Martin Goldstein (pianos); Jack Greenwood (percussion); W. Shakespeare (trumpet); Roy Wilcox (saxes, flute, clarinet); Emile Bibobi (guitar). Julian Slade will always be associated with that lovely, lively musical, Salad Days. Remember ‘We Said We Wouldn’t Look Back’ and ‘It’s Easy to Sing’ and all those other high-spirited songs? Well here’s another Julian Slade opus, Follow that Girl. After an initial run in Bristol, it opened at the Vaudeville Theatre on 17 March 1960 and ran for 211 performances. Follow That Girl’s happy-go-lucky story, is about Victoria Gilchrist. Her parents want her to marry one of two businessmen. She objects and runs away and is chased by the policeman Tom who falls in love with her. Romance and marriage follow in the tradition of the best musicals. Tom, of course, turns out to have ‘true blue’ parentage. On stage, Victoria was played by Susan Hampshire and Tom by Peter Gilmore. Others in the cast were James Cairncross - a prime collaborator with Slade and Reynolds in their musicals both as a performer and writer - Patricia Routledge and Robert MacBain. The Overture sets a happy mood with sunny swing music. The little ensemble makes a big sound. All the cheery numbers sparkle. I should mention a few: ‘Tra La La’ flutters along in quick waltz time continuing the mood of inconsequential gaiety in the usual Slade and Reynolds manner. ‘I’m away’ is a rather twee but charming number about the effects of love and joie de vivre. Its musical accompaniment’s opening suggests music-boxes and twittering birds. ‘Life Must Go On’ allows two ‘fop chappies’ to wax lyrical on sartorial elegance to Latin Rhythms. ‘Taken for a Ride’ has the ensemble breathlessly singing about the vicissitudes of travelling across the City by local transport. The final charming number, ‘Evening in London’, has the cast bidding a fond, sentimental farewell. The big tune is the title number with Peter Gilmore falling in love at first sight and determined to ‘Follow that Girl’ ‘…until he makes her his wife…’ The whole cast sings with spirit and unaffected enthusiasm. A bonus track to this CD has a delightful orchestral selection from Follow that Girl. It’s played by the Michael Collins Orchestra. 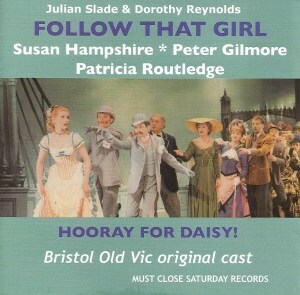 Hooray for Daisy, again by Slade and Reynolds, was first produced at Bristol too. This was followed by a London run at the Lyric Opera House Hammersmith around Christmas 1960. This recording has a dozen brief numbers that were squeezed onto two sides of an EP record. The mood of the show is very much the same. Annette Crosby sings gamely and charmingly but one gets the impression that it was all a bit of a struggle. ‘Wine is a Thing’ is a celebration of a tipple. In ‘Personally’ a gentleman tells a lady that he likes her and that ‘…you are a very pretty sight with the light - behind you…’. These amuse but really the songs are nothing special. Follow that Girl is worth following. A sparkling and breezy show.